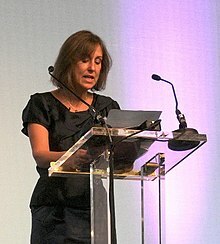 Kirsteen Anne "Kirsty" Wark FRSE (born 3 February 1955) is a Scottish journalist and television presenter, best known for fronting BBC Two's news and current affairs programme Newsnight since 1993, and its weekly arts spin-off Newsnight Review (later The Review Show) from 2002 to 2014. Wark was born in Dumfries to Jimmy Wark, a solicitor, and Roberta Wark, a schoolteacher. Wark was educated at Kilmarnock Grammar Primary and subsequently Ayr's independent Wellington School. She studied history at the University of Edinburgh. Wark joined the BBC in 1976 as a graduate researcher for BBC Radio Scotland, before promotion a year later as producer of Good Morning Scotland and current affairs programmes. Wark switched to television in 1982, producing BBC Scotland's lunchtime political programme Agenda and current affairs series Current Account. After a stint as a news editor for Reporting Scotland, she moved into presenting, fronting Seven Days and Left, Right and Centre for BBC Scotland, before moving to network television as part of the Breakfast Time presenting team. In 1988, she was one of the first reporters to cover the Lockerbie disaster. In 1990, Wark demonstrated her distinctive line of questioning in an interview with Prime Minister Margaret Thatcher. Wark was a presenter on BBC2 arts programme The Late Show (from 1990–3) and the heritage programme One Foot in the Past. She has been a presenter on the BBC programme Newsnight since 1993. She married television producer Alan Clements (born 1961) in September 1989, after meeting on the BBC Scotland programme Left, Right, and Centre. They have a daughter (born 1990) and a son (born 1992). They founded independent TV production company Wark-Clements in 1990, which in May 2004 was merged with fellow Scots broadcaster Muriel Gray's Ideal World to form IWC Media. In December 2005, Wark and Gray severed their connections with IWC Media after RDF Media bought the company. Wark hosted the 10th annual Glenfiddich Spirit of Scotland Awards on 30 November 2007 for STV. She replaced David Baddiel as host of the BBC Four programme The Book Quiz in 2008 and hosts a BBC Two quiz show, A Question of Genius, which started in March 2009. In 2011 she was chosen to host a BBC food quiz show entitled A Question of Taste, pitting two teams of food fanatics against one another. In June 2006 she interviewed Nobel Prize-winning playwright Harold Pinter. She made a cameo appearance in the 2008 Doctor Who episode "The Poison Sky". In 2006, she presented a series of programmes on BBC television about countries on the continent entitled Tales from Old Europe. Wark participated in the 2011 series of Celebrity MasterChef where she reached the final and narrowly lost out to Phil Vickery. On 1 January 2012, Wark appeared in a cameo role as herself in the revival of the BBC's Absolutely Fabulous. In January 2013 she appeared in a special series of The Great British Bake Off. Later that year, she made a cameo appearance in two episodes of The Politician's Husband which aired on BBC Two. She was listed as one of the fifty best-dressed over 50s by the Guardian in March 2013. Wark was elected a Fellow of the Royal Society of Edinburgh in March 2017. In June 2007, Wark clashed with Scottish First Minister Alex Salmond in an interview over his response to a memorandum of understanding between the UK Government and Libya regarding prisoner exchanges. Salmond feared that this could include Abdelbaset al-Megrahi, who was convicted by a court in Scotland, for the 1988 bombing of Pan Am Flight 103 over Lockerbie. The BBC, after having received 120 formal complaints, issued a public apology to Salmond regretting the "rude and dismissive" tone of the presenter. A spokesman for the First Minister said that Alex Salmond accepted the BBC's apology. According to Newsnight editor Peter Barron, some viewers questioned the premise of the interview; that the new SNP government appeared to be picking a fight with London. Other viewers thought that Wark's line of questioning was too aggressive and therefore discourteous. The biggest controversy, however, regarded how the interview ended. According to Barron, time constraints forced Wark to end the questioning abruptly, leading him to perceive her behaviour as "rude and dismissive". Wark is regarded as being close to the Labour Party. Donald Dewar, Scottish Labour politician and former First Minister of Scotland, a close friend, appointed her to the Scottish Parliament Building Design Selection Panel, which chose Enric Miralles' design for the new parliament. Questioned by the Fraser Inquiry, set up to investigate the building's cost overruns, she said: "There was no way that we were making a decision on economically the most advantageous tender; you would have ended up with a shed . . . it was [about] getting a building which was the most exciting, innovative building . . ." In 2003, Wark-Clements produced a film on the building, with critics accusing Wark of a conflict of interest. In January 2005, she became involved in controversy after she invited Labour MSP Jack McConnell, then Scotland's First Minister, and his family to stay at her Majorcan holiday home over the New Year period. McConnell, a long-time friend of Wark and husband Clements before holding office, was cleared of any improprieties when the Scottish Parliament's Standards Committee deemed he received no financial benefits from the holidays. Wark's editor on Newsnight offered his support, stating, "Many people in the media have friends who have gone on to hold office. The important issue is your ability to ask tough questions and that is not a problem with Kirsty Wark or anybody else on the programme." However such controversies have led to questions about her ability to behave impartially. Wark and Clements were the subject of much coverage in The Guardian, The Independent, Daily Mail, The Times and The Daily Telegraph regarding his use of Wark's former PA to monitor emails covertly at RDF Media after he left following an acrimonious dispute about a non-compete deal. In October 2013 on the BBC's Newsnight, Wark interviewed Guardian journalist Glenn Greenwald about his reporting of the NSA and GCHQ cyber-spying programs leaked by Edward Snowden. The interview was seen as openly hostile in which "Wark unabashedly made the case for the prosecution, interrogating Greenwald about his reporting and Edward Snowden." Greenwald later wrote that Wark and other journalists have focused "almost entirely on the process questions surrounding the reporting rather than the substance of the revelations" about NSA surveillance and privacy invasions "and in the process made some quite dubious claims that come straight from the mouths of government officials". ^ "My Best Teacher;Interview;Kirsty Wark". 6 September 2015. ^ "Some former pupils show the way". Herald Scotland. 6 October 1998. Retrieved 2 January 2012. ^ Sale, Jonathan (6 March 1997). "PASSED/FAILED: Kirsty Wark". The Independent. Retrieved 13 April 2019. ^ a b Network, Ayrshire Arts. "Visual Arts Group". ^ "Match of the day". The Glasgow Herald. 2 October 1989. p. 3. Retrieved 14 April 2019. ^ Wark, Kirsty (23 June 2006). "Harold Pinter on Newsnight Review". Newsnight website. BBC Two. Retrieved 10 October 2008. ^ Mulholland, H; agencies (8 June 2007). "Scottish ministers attack No 10 over Lockerbie bomber". Special Reports. London: The Guardian. Retrieved 25 September 2007. ^ a b Barron, P. (8 June 2007). "That Salmond interview". The Editors. BBC. Retrieved 25 September 2007. ^ "Wark's Labour links- now Tory leaders demand action by BBC". Scotlandonsunday.scotsman.com. 8 January 2005. Retrieved 4 November 2013. ^ Vanessa Thorpe (4 October 2009). "TV debates: So who would chair them?". London: Guardian. Retrieved 4 November 2013. ^ "Kirsty Wark and Jack McConnell". Edinburgh: News.scotsman.com. Retrieved 4 November 2013. ^ Holyrood Inquiry. "Transcript: Wednesday 26 November 2003 (Morning Session)". Retrieved 15 August 2007. ^ Peterkin, T; T. Leonard (28 November 2003). "Dispute over Kirsty Wark evidence on Holyrood". News. London: The Telegraph. Retrieved 15 August 2007. ^ Vass, S; L. McDougall (9 January 2005). "Wark: Its a McCarthyite witch-hunt". Sunday Herald. Archived from the original on 27 October 2007. Retrieved 25 September 2007. ^ McSmith, Andy (6 November 2007). "Wark and husband investigated for data theft". The Independent. London. Retrieved 7 May 2010. ^ "Kirsty Wark's husband loses court battle as judge frowns upon his email hacking". Daily Mail. London. 5 December 2007. Archived from the original on 11 October 2013. ^ "Glenn Greenwald trashes GCHQ/NSA apologists Kirsty Wark, Pauline Neville-Jones (03Oct13)". YouTube. 3 October 2013. Retrieved 4 November 2013. ^ Mirkinson, Jack (4 October 2013). "Glenn Greenwald Faces Off With 'Newsnight' Interviewer in Hostile Clash (VIDEO)". Huffingtonpost.com. Retrieved 4 November 2013. ^ "The NSA debate is as much about journalism as surveillance | Glenn Greenwald | Comment is free". theguardian.com. Retrieved 4 November 2013. Burrell, Ian (25 September 2007). "Kirsty Wark: Woman of substance answers back". Media. The Independent (London). Archived from the original on 22 October 2007. Retrieved 25 September 2007.